Beach Ponta Kitesurf, Windsurf & Wakeboard Apartment in Viganj, apartments are only 100 meters from the beach, fully equipped with large terrace, kitchen, grill, air-condition, a restaurant in the house and free wifi, large parking place, pets allowed, open-air Barbecue. 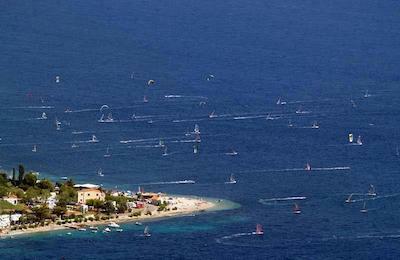 The Sports center is based in one of the windiest and popular windy and popular Kitesurfing destinations in Croatia. The courses and lessons are offered in the following: English, German, Croatian, Slovenian, Polish, Czech. Steady wind, almost flat water and beautiful surroundings, everything is within walking distance, the atmosphere is fantastic. You can also spend your time wakeboarding, using SUP, kayaking and bike rental. Steady wind, almost flat water and beautiful surroundings, everything is within walking distance, the atmosphere is fantastic. A perfect place to do sports. Good winds from the middle of May to the middle of may September. You will find perfect winds for all levels during the day. The courses are in different languages: English, German, Slovenian, Croatian, Polish, Czech. The maximum number of the student for one instructor is 3. The courses start every day. We offer also a beginner, advanced and private lessons. Lessons last 14 hours, for 4 – 5 days. They are run with radio helmets, so all you need to do is practice and listen to your experienced instructor guiding you. 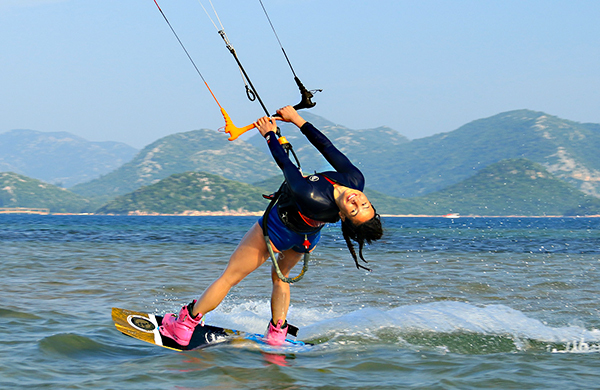 You can also rent and test the latest RRD Kitesurfing equipment. We welcome you to experience an unforgettable Kitesurfing vacation! The apartments are on 300m away from the main surf beach. Supermarket is 500m away, Restaurant 50m away, bars 100m away. Pharmacy, petrol station, doctor is 7km away. Take the motorway to Ploče, then the road to Viganj (after Ploče follows the signs for Dubrovnik, then take a right turn to Ston – you will pass Neum, Ston, and Orebić on the way to Viganj). Viganj is located a couple of kilometers after Orebić and our apartments are easily reached via the seaside road when you exit Orebić. Catching the Ploče-Trpanj ferry line makes for a nice shortcut. Though it doesn’t save you time, it provides an opportunity to stretch your legs and enjoy a drink, instead of sitting in the car. Viganj is a 30-minute drive from Trpanj. Viganj is connected to Korčula by a direct line which operates 3 times a day. Besides this line, Orebić and Korčula are connected with a ferry line and passenger boats departing every 30 minutes. Ferry lines connect Korčula to Split and Dubrovnik, but on those lines, cars cannot embark or disembark at Korčula. This is a coastal line operating 3 times a week. From Split there is a catamaran line for Korčula, and a catamaran and ferry line for Vela Luka. Frequent bus lines operate between Vela Luka and Korčula. The closest airport is in Dubrovnik. From Split airport it takes only 3 hours by car. Airports provide rent-a-car services and are connected with buses to the nearest city. We are open from April 25th until November 11th.